- Connect air purge first if installing in process already at operating temperature. Provide minimum 5 psig (30 kPa) air pressure. - Install IRt/c and align to view the desired target. Bring target to operating temperature if not already there. Connect leads to readout device to be used (controller, PLC, etc.). - If the target temperature is not known, measure the target temperature with an accurate reference. Remove the setscrew to expose the calibration screw. Adjust the calibration screw to obtain reading desired. Replace the setscrew cover when complete. For final process adjustments, the ZERO or OFFSET adjustments available on readout devices can be conveniently used. To maximize the linear range, see Tech Note #70. 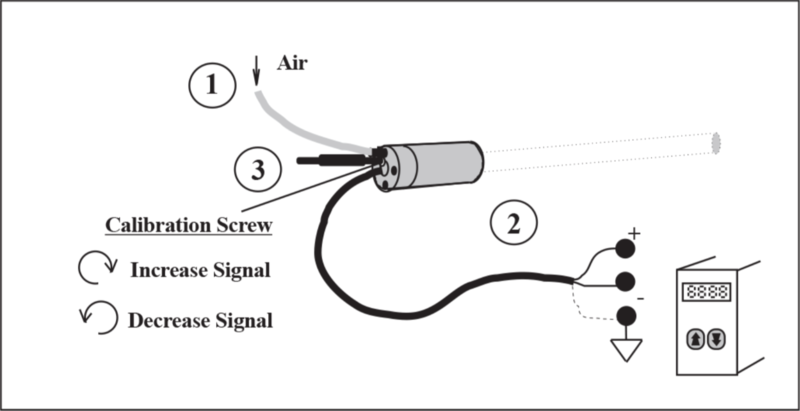 Calibration screw operates like a radio volume control: clockwise increases signal.